Notes: Groundhogs appear while harvesting crops, food crops are more effective than flowers. 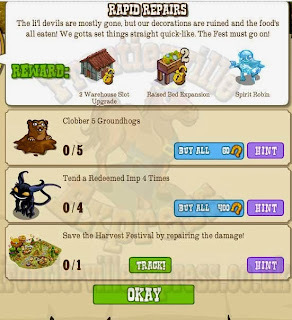 Redeemed Imps come from Pilfered Payloads which drop from Grass, Rocks, Thorns, Harvest Gourds and the Harvest Basket Daily Bonus. All building details are HERE.